Working efficiently in modern business demands fast and fail-safe data transfer and reliable communications systems. You can rely on this router for secure site connectivity via IPSec VPN, and high availability thanks to dual-SIM LTE/4G with up to 100 Mbps in addition to the integrated VDSL2/ADSL2+ modem. Thanks to the integrated VDSL2/ADSL2+ modem and VDSL2-Vectoring, the LANCOM 1781VA-4G supports high-speed VDSL with up to 100 Mbps and offers maximum versatility for your transition from ADSL to VDSL. The smart choice for the future viability of your network. Thanks to its twin integrated SIM-card slots, the LANCOM 1781VA-4G enables intelligent mobile backup scenarios, for example if a provider network goes down or the mobile data volume is exhausted. All-in-all it is a high-performance basis for no-compromise backup scenarios and highly available networks in any industry. 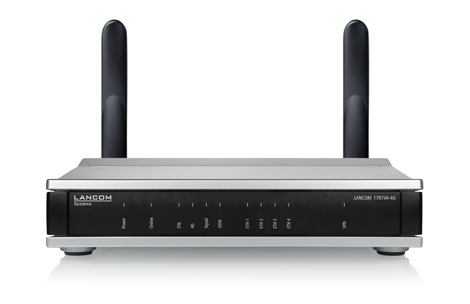 The LANCOM 1780VA-4G offers high levels of security. 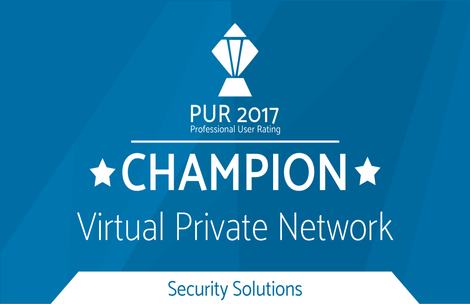 The standard equipment of 5 IPSec VPN channels guarantees strong encryption, secure connections for mobile employees, and protection of corporate data. 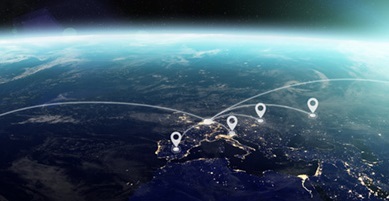 The LANCOM VPN option upgrades the router to support 25 VPN channels. This ensures that your network is perfectly scalable and can grow on demand - without additional hardware components. The LANCOM 1780VA-4G provides up to 16 securely isolated IP contexts, each of which has its own separate routing. This is an elegant way of operating IP applications with one central router and keeping the different communication channels securely separated from one another. Thanks to the support of hardware NAT, the LANCOM 1781VA-4G achieves a routing performance of up to 930 Mbps. Hence the transmission of IP packages is accelerated to its maximum. The high-performance hardware platform also enables a VPN encryption performance of 250 Mbps and offers powerful performance reserves even if extended by further software options. With the LANCOM 1781VA-4G corporate networks can be upgraded for the use of the Internet protocol IPv6 using their current infrastructure. Due to the implementation of dual-stack, the router can be operated in pure IPv4, pure IPv6, or mixed networks. On top of that, several times a year free-of-charge updates for the LANCOM Operating System (LCOS) are available. Hence, LANCOM offers maximum safeguarding of your investment. 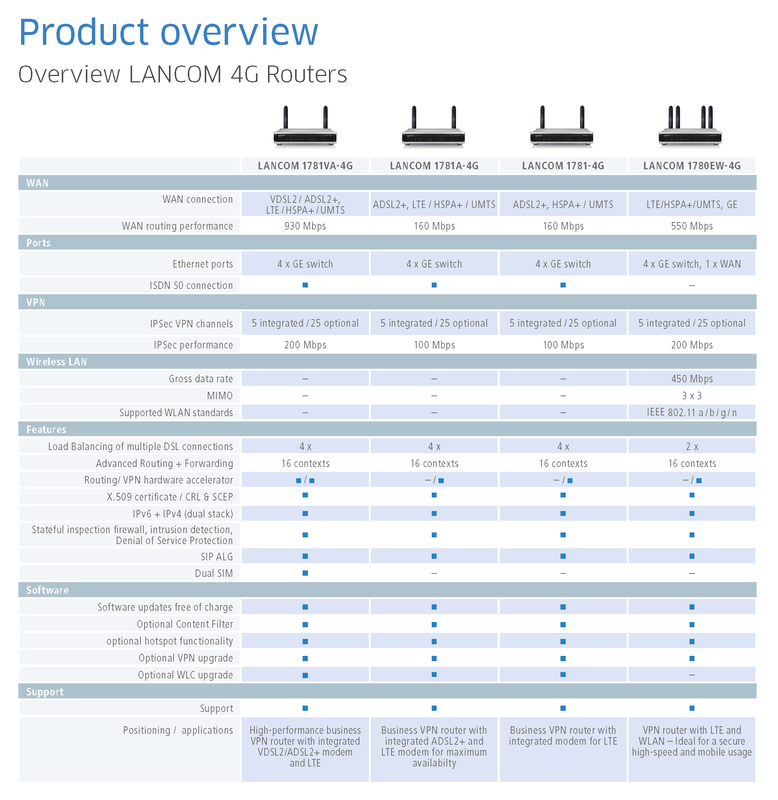 LANCOM VPN routers are the basis for secure encrypted site connectivity and high-speed Internet access. As professional system components, they are fully compatible to all LANCOM network components and enable flexible scaling and expansion when using further LANCOM components. The result is a secure and flexible all-round solution that you can rely on. The overall network down to each individual device can be managed and monitored from a central instance - for a solution that is systematic.